Paul Nogier (1908-1996) would today be very proud to see how many 'adoptive children' he has around the world. 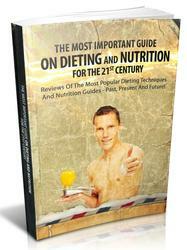 In my opinion, ear acupuncture is one of the most intriguing discoveries of the last 50 years. 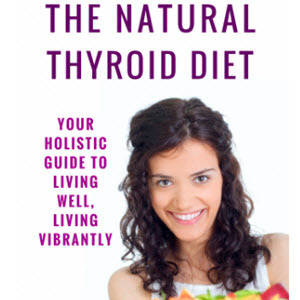 Two lessons have ensued from Nogier's experience: the first is that even a single physician, without expensive and sophisticated instruments, can perform good research, following his clinical instinct and rigorously analyzing his observations. The second is that every revolutionary approach in the field of medicine has to struggle before being accepted by the scientific community. Over the last 20 years the great increase in complementary/ alternative methods has brought an equally increasing request among therapists and patients for evidence-based information on their efficacy. 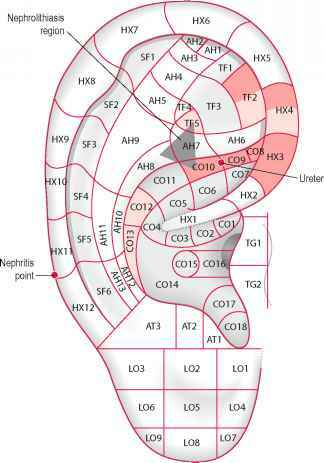 Ear acupuncture is no exception, and a full knowledge of the range of its possibilities needs to be brought to light. 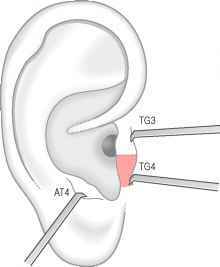 It can be freely stated that there is still much work to do with both auricular diagnosis and auricular therapy. 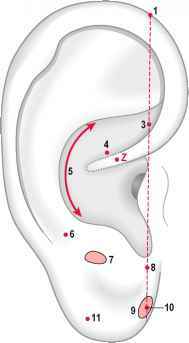 As regards diagnosis there are still portions of the auricle which have to be thoroughly explored, for example the ear lobe, the helix and the medial surface of the auricle. 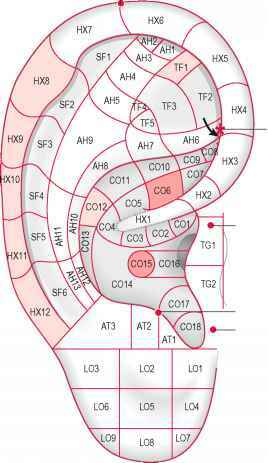 To imagine that the central nervous system is represented on the ear lobe does not mean that we have the key consistently to identify the areas corresponding to specific parts of the brain. 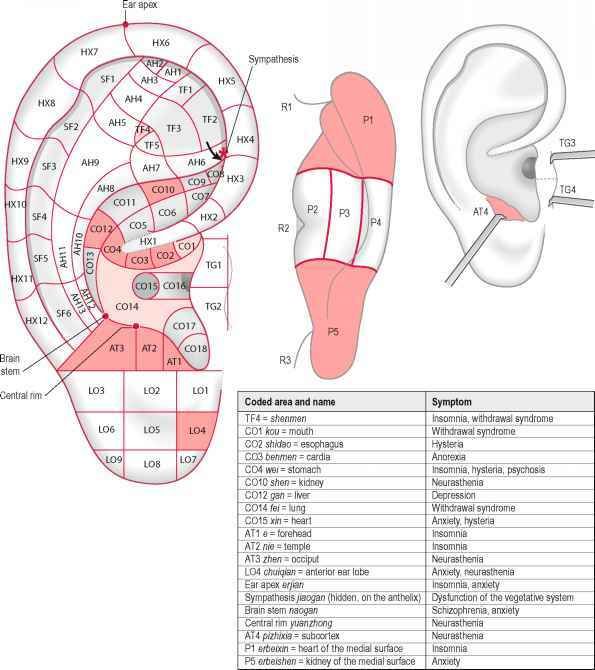 The simplification expressed commonly by Western researchers that one auricular zone is the representation of one anatomical structure is probably wrong, and we should convince ourselves that the same organ can have multiple representations on the ear as has been expressed by both Chinese practitioners and Western physicians practicing auriculomedicine. Therefore we need specific methodology to discover these associations with direct and indirect methods. The direct methods, through modern imaging techniques such as fMRI, PET, etc., could evaluate which structures of the brain are activated by auricular stimulation, either in healthy subjects or in patients with pain or other neurological disorders. 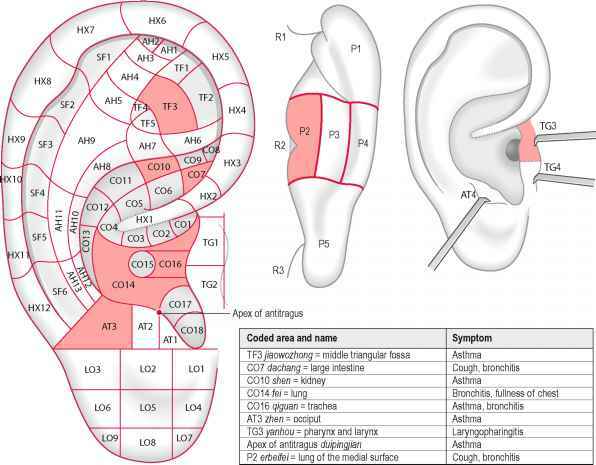 The indirect methods, however, using the diagnostic procedures proposed in this book, may help the clinician to identify recurrent auricular areas associated with different symptoms or syndromes. 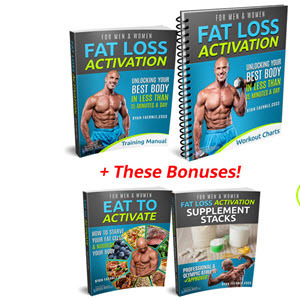 This is furthermore necessary because there is often no complete consensus between the different schools concerning the somatotopic representations of the body. The interpretation of these multiple clusters of points brings to mind someone doing a jigsaw puzzle with no knowledge of the final picture. 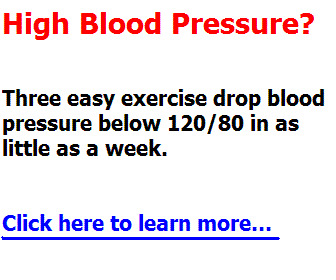 One of the aims of this patient and perhaps endless work is to attribute finally much more importance to the autonomic nervous system which thus far seems so insufficiently investigated. Contemporary anatomists do not study the morphology of this system and it is unlikely that they are given adequate grants or funding for such research. Consequently medical students still receive the same information on a few pages of their anatomy books as they did 20-30 years ago. 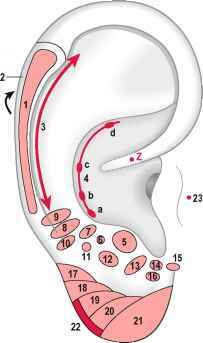 The autonomic nervous system, however, is essential for all functions of our body and auricular diagnosis gives us the opportunity to examine the concha which it should be remembered is the only zone of the body where the tenth cranial nerve comes to the surface. 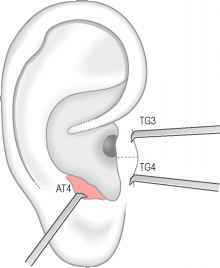 Another interesting therapeutic combination could be the inclusion of ear acupuncture in rehabilitation programs, to reduce the number of sessions and the total cost of rehabilitation. 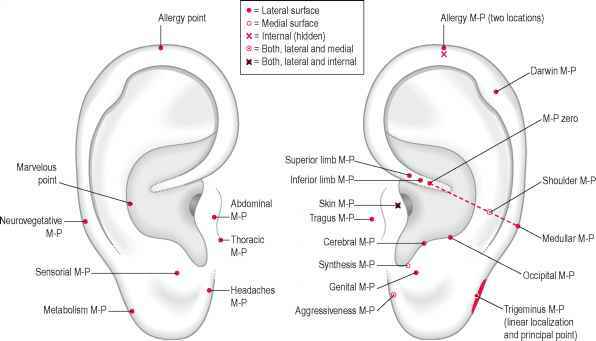 The second important aspect of auricular therapy, which has not yet been taken into consideration adequately, is the measurement of the therapeutic effect of non-invasive stimulation of the auricle such as massage, magnetic pearls, Vaccaria seeds, electrical and laser stimulation, etc. This is an important issue because many therapists are not medical doctors and in several countries are not allowed to insert needles. The peculiarity of the auricle from the neurophysiological point of view seems to support the hypothesis that light, non-invasive stimulation may have a significant therapeutic effect. 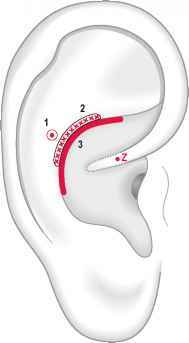 There is an urgent need to face these issues in order to place ear acupuncture definitively among the evi-denced-based complementary therapeutic methods. diagnostic method adopted. To offer readers an easy and advantageous comparison of the auricular representation of the body according to different medical traditions and schools of thought, the maps have been arranged in pairs, allowing face to face consultation of the French map on the left page with the corresponding Chinese map on the right-hand page. Fig. A1.1 The somatotopic representations of the body and of the cephalic extremity according to Nogier1,2,3,4 (z = point zero). Fig. A1.3 The somatotopic representations of the nervous system according to Nogier1,2,3,4 (z = point zero). Fig. A1.5 The somatotopic representations of the endocrine system according to Nogier1,2,3,4 (z = point zero). Fig. 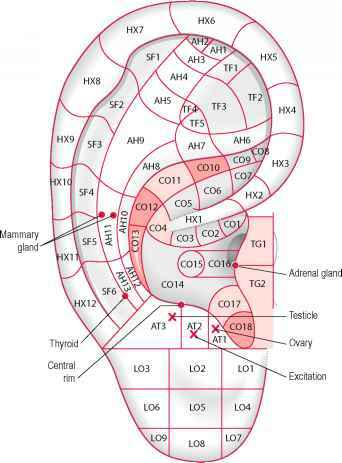 A1.6 The representation of some areas related to disorders of the endocrine system and the metabolism according to the Chinese standardization5,6 (in pale pink the areas associated with diabetes and obesity). Fig. A1.7 The somatotopic representations of the cardiovascular system according to Nogier1,2,3,4 (z = point zero). Fig. 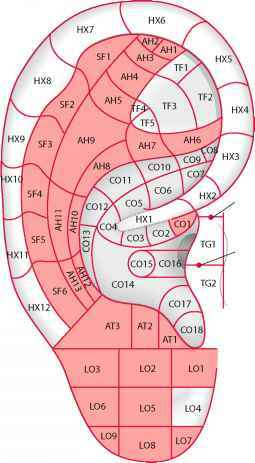 A1.8 The representation of some areas related to symptoms/disorders of the cardiovascular system and hypertension according to the Chinese standardization5,6 (in pale pink the areas associated with hypertension). Fig. A1.9 The somatotopic representations of the respiratory system according to Nogier1,2,3,4 (z = point zero). Fig. A1.11 The somatotopic representations of the digestive system according to Nogier1,2,3,4 (z = point zero). Fig. 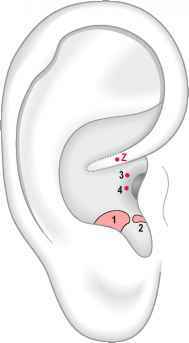 A1.13 The somatotopic representation of the genitourinary system according to Nogier1,2,3,4 (z = point zero). Fig. 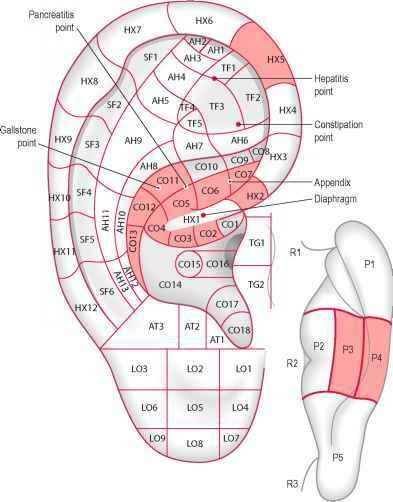 A1.14 The representation of the areas related to the genitourinary system according to the Chinese standardization5,6 (in pale pink the areas associated particularly with disorders of the female genital apparatus). Fig. A1.15 The somatotopic representations of some points/areas related to mental disorders according to Nogier and Bourdiol1,2,3,7 (z = point zero). Fig. 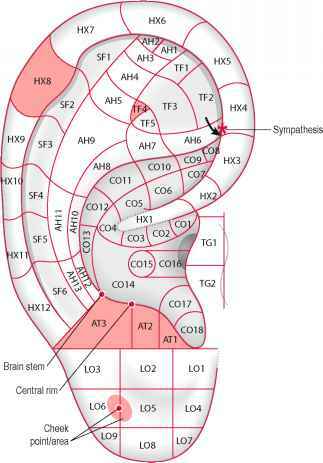 A1.16 The representation of the areas associated to mental disorders according to the Chinese standardization5,6 (in pale pink the areas associated with the drug withdrawal syndrome).